Manzano Animal Clinic’s experienced support staff strive to provide personalized, compassionate care for our patients and clients alike. Leah is a New Mexico native, born and raised right here in Albuquerque. She graduated in 2013 from CNM with an Associates of Applied Science in Veterinary Technology. Leah shares her home with a Border Collie named Roo and Toby the cat. She loves to play soccer in her spare time and take Roo to the park to chase her ball. Some of Leah's favorite things about veterinary medicine include interacting with the animals and clients and being able to help make sick patients get back to their normal selves. 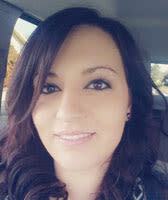 Leah is our lead technician and has been a part of our team since 2016. Lynda was born in Heidleberg, Germany and moved to New Mexico as a young child after traveling abroad with her family. She graduated in 1998 from Pima Medical Institute with a Veterinary Assistant Certificate. Lynda has three dogs: a Chihuahua mix named Baby, a pug mix named Dobby, and an American Bulldog named Lucius. When not working, Lynda enjoys reading, watching movies, and baking. One of her favorite things about veterinary medicine is getting to know clients and their pets. Lynda is our lead receptionist and has been a part of our team since 2004. Michelle was born and raised in Tucson, Arizona. She moved to Albuquerque with her high school sweetheart after graduating from the University of Arizona with a BS in Veterinary Science. They share their home with an adorable French Bulldog named Bernard. When not at the clinic, Michelle enjoys listening to music, cooking and spending time with her family. Her favorite thing about veterinary medicine is being able to work with wonderful people who share her love of animals. Michelle is our hospital manager and has been a part of our team since 2001. Jasmin is originally from California. She was born in West Coving and grew up in Baldwin Park. Jasmin graduated with a BS in Wildlife Management and Conservation in 2014 from Humboldt State University and made her way out to New Mexico in 2017. She shares her home with two miniature Dachshunds, Bailey and Carly, and two Sulcata tortoises, Priscilla and Buttercup. Jasmin enjoys hiking, birding, and gardening with her dogs in her free time. One of her favorite things about veterinary medicine is working with others that love animals and care about their well-being as much as she does. 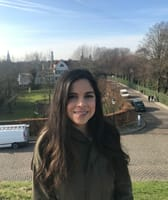 Jasmin is one of our technicians and has been a part of our team since 2018. Melissa was born and raised in Tucson, Arizona and moved to New Mexico in 2004. She graduated in 2012 from CNM with an Associates of Applied Science in Veterinary Technology. 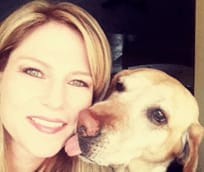 Melissa has a Labrador Retriever named Bear and two cats, Ava and Willow. When she is not at work, she enjoys spending time with her daughters, learning to play the bass guitar, cross-stitching, crocheting, and listening to live local music. Some of Melissa's favorite things about veterinary medicine are getting to interact with great clients, providing quality care to pets, and being a part of a great team of professionals. 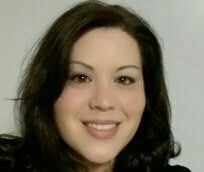 Melissa is one of our registered technicians and has been a part of our team since 2016. Ken was born in Tucson, Arizona and spent his childhood traveling the states being part of a military family. 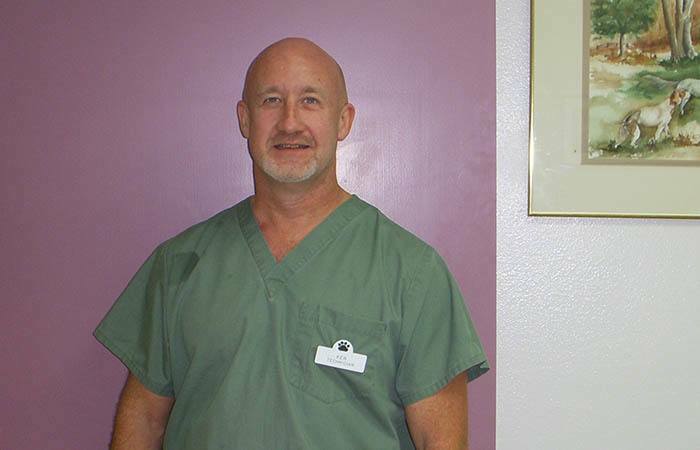 He has worked in the Albuquerque veterinary field for over 30 years. Besides his career in veterinary medicine, Ken also found time to earn his CDL license. In his free time, he likes wood-working, playing table tennis, going on motorcycle rides, traveling, and repairing automobiles. Two of his favorite things about veterinary medicine are being able to watch our patients grow up and teaching clients about different options for their pets. Ken is one of our technicians and has been a part of our team since 1991. Luvina is one of our native New Mexicans; she was born in Las Cruces and raised in Espanola. She graduated in 2017 from UNM with a BS in Biology. 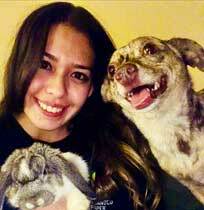 Luvina has three cute critters at home: a Catahoula Chihuahua mix named Gypsy, Bella the Calico cat, and a Mini Lop bunny named Ruby. In her free time, she enjoys cycling, hiking, and crafting. 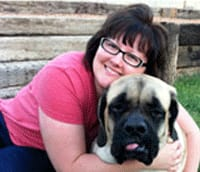 Two of her favorite things about veterinary medicine are being able to help creatures who are unable to verbally or physically help themselves and providing clients with knowledge to better care for their pets. Luvina is one of our receptionists and has been a part of our team since 2018.